Despite being the world’s most common form of glomerulonephritis, IgA Nephropathy treatment strategies have hereto been controversial, particularly surrounding the use of immnosuppression on top of traditional RAAS blockade. The long awaited, Intensive Supportive Care plus Immunosuppression in IgA Nephropathy (STOP-IgAN) in this month’s New England Journal of Medicine set out to clarify this issue. Study Design and Methods: 337 patients aged 18-70 were enrolled into this multicentre, prospective, open-label, randomised controlled trial. Key inclusion criteria included biopsy proven IgA Nephropathy, 0.75g/day proteinuria, together with hypertension (defined as ≥140/90), impaired renal function (eGFR<90ml/min) or both. All patients underwent an initial six month period of supportive care which included maximal recommended or tolerated RAAS blockade, cholesterol lowering with statins and smoking cessation advice. At the end of this period those with proteinuria between 0.75 and 3.5g per litre were eligible for randomisation into immunosuppression or continuation of supportive care groups. This is important as previous studies have discontinued RAAS inhibition before recruitment. Allowing for dropout and exclusion, 162 patients were randomised with 80 for supportive care and 82 for immunosuppression. Demographics of the two arms were not significantly different and enrolment was for three years. In the immunosupression arm, those with an eGFR of ≥60 received 1g IV methylprednisolone on the first three days of months 1,3 and 5 and otherwise 0.5mg/kg prednisolone on all other days for the duration of the study. Those with an eGFR of ≤30 received cyclophosphamide 1.5mg/kg/day for three months, then azathioprine 1.5mg/kg/day for months 4 to 36 together with prednisolone daily at a dose of 40mg daily tapered to 7.5mg from month 7. 1) Remission of IgA nephropathy defined as urine protein: creatinine ration <0.2g/24hours and stable renal function defined as a fall in eGFR of <5ml per minute per 1.73m² from baseline. 2) Fall in eGFR >15ml per minute per 1.73m² from baseline. Take home messages: Importantly, 34% of patients had <0.75g proteinuria per day at six months, with supportive care alone, further underlining the importance of this treatment strategy. At three years, 5% of patients in the supportive care as compared with 17% in the immunosuppression arm had achieved a complete remission (p=0.001). However between the same groups there was no significant difference in the number with a stable eGFR. At the end of three years there was also no significant difference in those having a decrease in eGFR ≥15ml per minute per 1.73m², 22 of 80 in supportive care versus 21 of 82 in the immunosuppression group. . While there was no difference in overall adverse events between the groups, predictably there was a significantly increased rate of impaired glucose tolerance in the immunosuppression arm, together with higher trends for infection, malignant neoplasm and indeed there was one sepsis related death in the immunosuppression group. Discussion: The authors should be commended for the good design, adherence to and implementation of KDIGO guidance. I think what this trial demonstrates best is that aggressive conservative therapy may lead to good outcomes in proteinuric IgA Nephropathy. The benefit of immunosuppression has not been demonstrated, particularly when the toxicity of the regimes are considered. Our practice will therefore be unlikely to change based on these results. I evaluated a young kidney donor candidate in clinic a few days ago and although he did not have any obvious medical issues and was an excellent candidate, he has been smoking half-a-pack a day of cigarettes for the last 10 years. I recommended that he needed to quit smoking, not only for his health, but also the recipient’s. For kidney transplant candidacy, recipients are strongly encouraged to stop smoking before and after transplantation. there is data that recipients with a history of smoking have a 2.1-2.3 times greater risk of poor graft survival . -In the Unites States, the most recent OPTN/UNOS guidelines from 2014, recommend only assessment for smoking but they don’t make any recommendations in regards to management prior to transplantation. No source of evidence is given. -The Consensus Statement on the Live Organ Donor state that smokers can be considered if they are tobacco free for 6 months prior to donation; no smoking history is preferable. -The 2011 British Transplantation Society guidelines state that donors should be encouraged for smoking cessation (B1-moderate quality of evidence, “we recommend”), frequent exercise and weight loss. -The 2005 Amsterdam Forum Guidelines advices smoking cessation at least 4 weeks before donation, based on expert opinion. -The 2010 Spanish Society guidelines, SEN-ONT recommend smoking cessation 4 weeks prior to surgery and patients are encouraged to stop smoking definitely. No level of evidence is given. A 2007 survey of 132 U.S. kidney transplant programs found that 80% of programs have a smoking policy when evaluating living donors. 35% of programs accept current smokers as living donors, and 36% require donors to commit to quitting before surgery. 20% of programs do not have a smoking policy and only 7% routinely exclude smokers. Only 2 programs perform toxicology screens to verify smoking cessation. In a most recent paper, the authors compared donor and recipient outcomes from kidney donors with active smoking history. They included 602 living donors (156 patients with active smoking) and they found out that smoking did not affect graft survival at the time of evaluation (HR = 1.19, P = 0.52) and was not associated with perioperative complications, but it had an impact on recipient’s survival at 10 years (HR = 1.93, p <0.01 vs HR = 1.74, p = 0.048). The authors acknowledge that recipient smoking was not examined in detail. Smoking cessation is difficult for patients and generally the success rate is about 5% at any given attempt. In one of our paired kidney exchange (PKE) meetings, we were reviewing a case about a donor from another program in whom smoking cessation was not strongly advised. It’s important to know that complete smoking cessation is not a requirement for donation and recipients enrolled on a PKE program should be well informed about donor’s smoking status as well, especially if the recipient’s donor is healthy. Regardless, living donation is far superior and given the available evidence (or lack of it), transplant centers should strongly continue to advise smoking cessation to living donor candidates. Larger studies need to be done to establish a definitive link between living donor smoking and recipient graft and survival outcomes. For my inaugural RFN post, a special case I saw last year with Dr. David Mount and Young-Soo Song a fellow nephrologist in training at BMC. A 74-year-old man with history of HTN, peripheral artery disease, CKD (baseline Cr 1.6) who initially presented with NSTEMI. He was placed with a balloon pump (IABP), and underwent CABG on Day 2. Post-operatively he was quickly weaned off pressors. 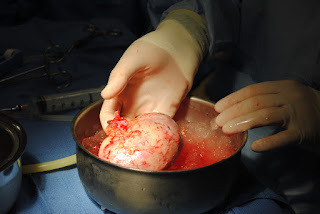 On Day 3, the IABP was removed. He suddenly became anuric. His creatinine increased from 2.0 on Day 2 to 3.17. He was evaluated for the differential of anuric AKI, we had a high suspicion for renal artery occlusion, due to the relation to the retrieval of the IABP. Angiography confirmed complete occlusion of the renal arteries. Attempts at IR-thrombectomy failed, the renal arteries were bluntly occluded at the level of the aorta. We decided to pursue revascularization despite some doubts from surgery. He underwent a Hepato-right renal artery bypass on day 7 (4 days after the insult). He was off dialysis, urinating freely with decreasing creatinine in less than a week. - On renal ultrasound the right kidney was 10.8 cm with normal echotexture. But the left kidney was 8.79 cm with cortical thinning suggesting a chronic renovascular disease. - The MAG-3 scan showed persistent perfusion of the right kidney From experimental models of renal ischemia, we know that there’s irrevocable destruction of the kidney, within hours of loss of perfusion (Sanchez Fructuoso, JASN 2000; Hamilton PB, Am J Physiol. 1948). 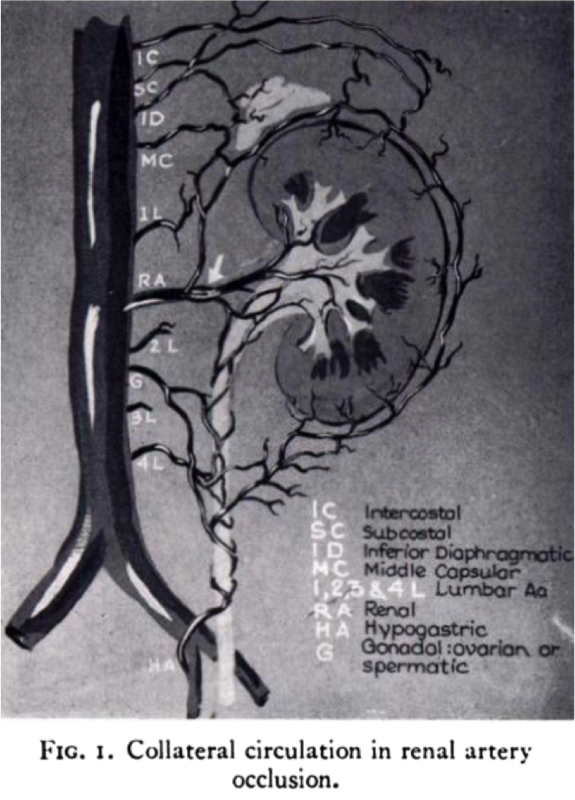 However, there’s a minimal perfusion pressure that is capable of maintaining nephron viability without sustaining filtration (Moyer, Annals Surg 1957). Renal perfusion is not only via the renal artery. There are small preformed collaterals that originate from the lumbar, internal iliac, gonadal, adrenal, renal capsular, intercostal, and mesenteric arteries. They can drain into the distal part of the renal artery or provide direct cortical perfusion (Love L, et al. Am J Roentgen 1968 and Lohse JR, Archives of Surgery 1982). 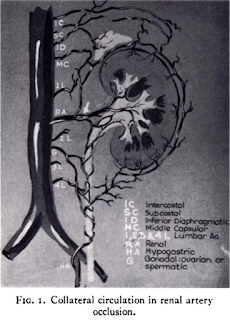 Renal ischemia provides a maximal stimulus for vasodilatation of these collaterals. In the case of our patient, his right kidney likely had sub-clinical renovascular disease that led to development of these collaterals. On occlusion of the renal artery he had sufficient collateral perfusion to maintain enough nephron viability to get off dialysis. In this table are a few examples that show how long these collaterals can maintain viability. -Patent distal main renal artery or the identification of collaterals. It’s important to notify the interventionalist that we’re looking for that, a routine angio will not pick that up easily. 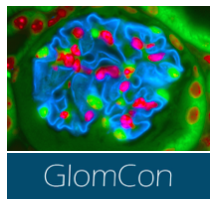 -Biopsy evidence of viable glomeruli in a representative specimen. Check out the excellent renal clinico-pathology conference series from Tim Yau from the Washington University in St. Louis Division of Nephrology. Follow Tim on Twitter @Maximal_Change. 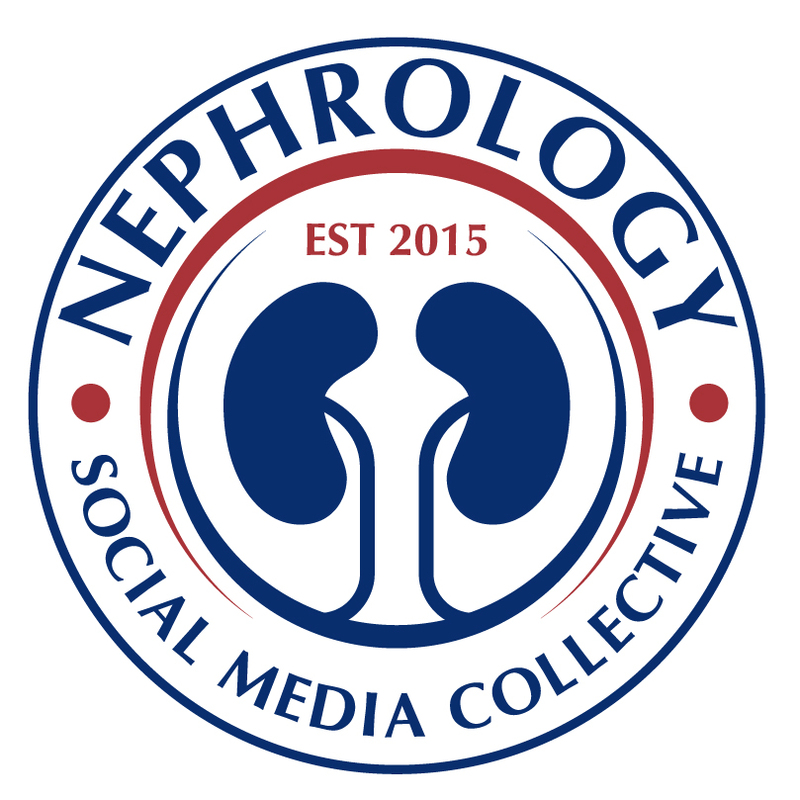 This is a great addition to the kidney blogosphere. Renal transplantation reduces mortality in elderly patients by more than 50%, however, challenges are magnified in elderly renal transplant recipients (RTR) when managing their pharmacotherapy regimen. 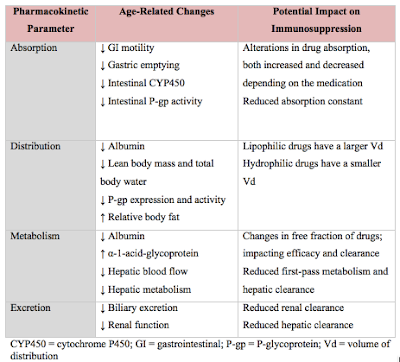 Aging is associated with changes in several pharmacokinetics parameters including absorption, distribution, metabolism, and excretion. 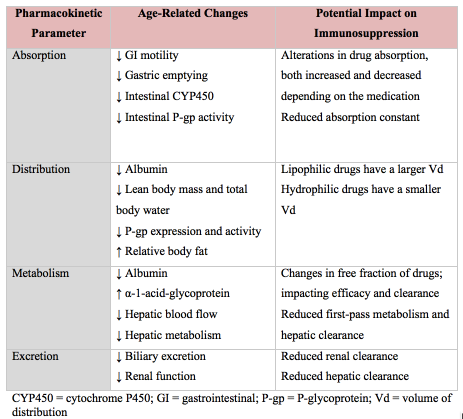 Developing an effective pharmacotherapeutic plan for elderly transplant recipients requires a clear understanding of the principles of pharmacokinetics and how a specific drug’s handling may be altered with age (Table ). Calcineurin Inhibitors (CNI): Several studies evaluated cyclosporin and tacrolimus in elderly RTR. Results show that CNI trough concentrations are 50% higher, Cmax and AUC are also higher, and mandate a dose reduction. These differences in concentration and exposure can be attributed to the good oral absorption, and a reduction in intestinal and hepatic metabolism and elimination. mToR inhibitors: Many studies of the mToR inhibitors included a pharmacokinetic subgroup analyses of the elderly. In these studies, there was no association seen between age and drug clearance. Antimetabolites: the elderly demonstrate lower mycophenolic acid (MPA) trough concentrations, Cmax and AUC compared to younger RTR. This is likely due to reduced MPA bioavailability of MPA in older patients. Another reason to explain the lower exposure to MPA in the elderly is that MPA is highly protein bound, yet there is a reduction in protein binding sites in the older population, which increased the free fraction of MPA making it more available for glucuronidation and clearance. Corticosteroids: there is little data on alteration of corticosteroid pharmacokinetics in elderly RTR; however, decisions can be made based on speculated changes. Prednisolone is extensively metabolized in the liver with significant intra- and inter-individual variability, and mainly binds to albumin. Age-related reductions in metabolism and elimination will likely result in an increased exposure to prednisolone and methylprednisolone. Belatacept has been studied in older population, and these analyses found that age-related changes, such as changes in renal function and albumin, did not affect exposure to belatacept. In sum, age broadly impacts immune responses as well the pharmacokinetics of the maintenance immunosuppressants, in particular CNI and MMF. There are some data to help aid in the creation of an immunosuppressant protocol in the older transplant recipient, but more specific studies of this patient population are needed. In our search for therapies to reduce CKD progression, hyperuricemia has historically not been a major target despite being a potential risk factor for progression. Two recent studies however, raise the possibility that treating hyperuricemia could slow progression. Should hyperuricemia be a treatment target? Hyperuricemia is associated with hypertension, cardiovascular disease, the metabolic syndrome, inflammation, and oxidative stress. The role of uric acid as a risk factor for incident CKD or CKD progression is more controversial. However, there are studies that suggest a pathophysiologic role for hyperuricemia. For example, in a study of over 20,000 healthy Austrians, serum levels of 7-8.9 mg/dl and ≥ 9 mg/dl were associated with odds ratios for CKD of 1.74 and 3.12 respectively. This was after adjusting for renal function, metabolic syndrome, and blood pressure agents, which are all independently associated with hyperuricemia. More recently, hyperuricemia was also associated with incident CKD in patients with type 2 diabetes. However, not all studies have shown that hyperuricemia worsens renal disease. For example, an analysis of the MDRD study, identified hyperuricemia as a risk factor for cardiovascular mortality but not renal failure. Uric acid’s effect on inflammation, oxidative stress, and endothelial dysfunction certainly could worsen renal function. Hyperuricemia activates RAS and contributes to systemic and glomerular hypertension in animal models. Hyperuricemic animal models are associated with vascular damage and tubulointerstitial fibrosis, which can be alleviated by reducing uric acid levels pharmacologically. 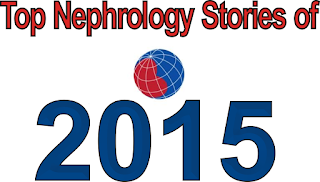 More information on the pathophysiology of uric acid in CKD can be reviewed here. This year, two small studies evaluated the prospect of treating hyperuricemia to reduce CKD progression. Joel's Dream RCT coming to life. Goicoechea et al published in AJKD a follow-up to their earlier trial from Spain evaluating the use of allopurinol. 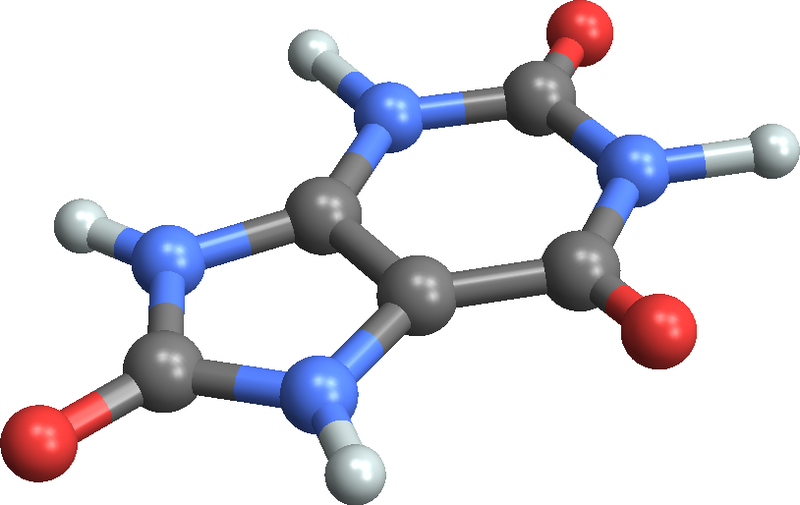 The original trial was a 2-year study of allopurinol, 100 mg/d, vs. placebo in 113 subjects. This recent paper described a subsequent 5-year follow-up study with 107 subjects. In their intention to treat analysis, allopurinol appeared to reduce the risk of renal events (needing dialysis or doubling of Cr) and cardiovascular events by about ½. Notably, during the follow-up period, approximately 20% of the intervention group patients stopped allopurinol while a similar percentage in the control group started allopurinol. This study, again reported in AJKD performed in India, is a 6-month RCT trial of febuxostat (40 mg) vs. placebo in 93 patients. As expected, febuxostat reduced uric acid levels effectively (9 --> 5.2 mg/dL vs. 8.2 --> 7.8 mg/dL in controls). However, febuxostat also reduced the primary outcome of GFR decline with fewer patients having ≥ 10% decline in eGFR from baseline (38% vs. 54%, p 0.004). These rather small studies, based primarily on surrogate outcomes, show that there may be a possible benefit to treating hyperuricemia, but this is far from definite. Two meta-analyses (one and two), both published prior to the recent febuxostat study, suggest that urate lowering therapy may reduce CKD progression. However, they mostly highlight the overall poor quality of evidence addressing this subject. Unfortunately, at this time there are no further trials registered on clinicaltrials.gov. In the end, perhaps for the very concerned patient who is meeting all the other well defined goals to reduce CKD progression, hyperuricemia should be controlled to reduce CKD progression. Though clearly the data is far from conclusive. On a related note, an international research group recently published an article about the role of uric acid damage in Mesoamerican nephropathy which is well worth reading (AJKD, “Heat stress nephropathy from exercise induced uric acid crystalluria: a perspective on Mesoamerican nephropathy”). Finally, one might wonder why humans and apes developed hyperuricemia compared to the majority of mammals. As noted here (Goh, RFN blog), hyperuricemia may have provided our ancestors with an evolutionary advantage by maintaining blood pressure in a sodium poor environment. 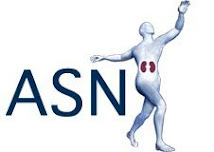 "The primary aim of the study is to test the hypothesis that uric acid lowering therapy with the xanthine oxidase (XO) inhibitor, allopurinol, will significantly slow kidney failure progression in patients with moderate chronic kidney disease (CKD). 620 adult participants with CKD stages 3 or 4 who have experienced rapid progression of their CKD over the preceding 12 months will be recruited to the trial. Participants will be randomised 1:1 to receive 100-300 mg of allopurinol daily (dose dependent on CKD stage and tolerance), and treatment will be blinded to participant and treating team. The primary outcome measure will be an assessment of eGFR throughout and at the end of the 24 month treatment period as a marker of CKD progression, and a series of secondary outcomes related to blood pressure, proteinuria, cardiovascular events and death will also be measured." Hepatitis C infection is a major public health issue, affecting approximately 2.8% of the world’s population (>185 million people worldwide). Approximately 250,000 Canadians were living with chronic hepatitis C as of 2011.Specifically in the hemodialysis population,DOPPS data estimated the prevalence of HCV (patients randomly selected from 308 representative dialysis facilities in France, Germany, Italy, Japan, Spain, the UK, and the US) at 13.5 percent. Other than the liver complications associated with HCV, we (as a nephrology community) are also concerned with the kidney -related complications like HCV related vasculitis and/or glomerulonephritis (such as mixed cryoglobulinemia) and in the transplant population (fibrosing cholestatic hepatitis and post transplant DM). The guidance for nephrologists regarding managing Hepatitis C in the CKD (dialysis and non-dialysis) comes from KDIGO, which suggested use of interferon or pegylated interferon with or without ribavarin (based on degree of kidney dysfunction). These therapies are associated with treatment-limiting toxic effects (they can cause or aggravate fatal or life-threatening autoimmune disorders, neuropsychiatric and ischemic disorders, and hemolytic anemia) as well as have sub-optimum efficacy. The most recent meta-analysis reported an overall estimate of sustained viral remission (SVR) in about one in three patients when treated for 16–48 weeks, whereas about 20–25% of patients did not complete the treatment due to adverse events. In addition, the longer treatment durations has meant patients being taken off the transplant waiting list while on therapy, adding to the dilemma about whether or not to treat. Notably, the use of interferon post kidney transplant is not recommended due to the increased risk of rejection. This all changed with the introduction of direct acting antiretroviral (DAA) agents. This has opened a new paradigm in the management of Hepatitis C in the general population with SVR rates >90%, few adverse effects with the duration of therapy being as short as 8–12 weeks. However, the renal elimination (>80%) of sofosbuvir (which has been the most common drug used in the general population clinical trials) means this drug has to be used with caution in patients with kidney dysfunction (especially with one trial showing increased adverse events). Additionally, one of the trials which used sofosbuvir in a reduced dose in CKD population showed reduction in efficacy with SVR rates of only 40%. This brings us to the C-Surfer Study. The C-Surfer Study, a randomized, parallel-group, multicenter, placebo-controlled Phase II/III trial, evaluated theefficacy and safety of grazoprevir and elbasvir (GZR/EBR) in HCV genotype 1–infected patients with Stage 4 or 5 CKD including patients on dialysis (N = 224). Patients were randomized to receive either immediate or deferred treatment with GZR/EBR (100/50 mg) once daily for 12 weeks. Patients randomized to the deferred treatment arm first received 12 weeks of placebo before starting GZR/EBR. The initial results were published in the Lancet earlier this year. In the placebo controlled phase, the primary end point of SVR12 (sustained viral remission at 12 months, defined as HCV RNA undetectable or below lower limit of quantification i.e. HCV RNA is detected but less than 15 IU/mL ) was achieved in 99% of patients who completed treatment. SVR12 was 94% in the intention-to-treat analysis. Serious adverse events (Cardiac disorders [AMI, Cardiac arrest , atrial fibrillation] elevated ALT and AST, Pancreatitis and ,pneumonia) were similar between the immediate treatment group and deferred treatment group (14.4 versus 16.8%). The final results of this study were presented at the late breaking trials, poster session, at the ASN Kidney Week 2015 in San Diego (final paper yet to be published). Deferred treatment group after placebo95% [96/101]). 1 patient stopping the regime for adverse events. Excluding subjects who discontinued for reasons unrelated to study drug, the overall SVR was 98.6% (211/214). Pharmacokinetic data indicate no need for dose adjustment in dialysis patients. Thus, it appears that the combination of GZR/EBR is a safe and effective option in patients with advanced CKD. Fixed-dose ombitasvir, paritaprevir, ritonavir and dasabuvir (3D regimen) (all components of this regimen are primarily excreted in the feces (>86%), with less than 11.3% renal elimination) with or without RBV is also being evaluated in the ongoing RUBY-I trial (involving 20 HCV genotype 1 treatment naïve non-cirrhotic patients with advanced CKD). The interim analysis have revealed that 10 of 10 patients achieved SVR4, and of those, 2 patients reached SVR12.Though these results look promising further data are required before making a recommendation for its use in the CKD population. Thus, the current and future treatment options for CKD patients with HCV genotypes 1 and 4 seem promising; however treatment of patients with genotypes 2 and 3 inthe CKD population still remains a challenge. What does SPRINT mean for HTN and CKD? There has been much fanfare regarding the release of the SPRINT trial in the last several weeks. Finally, evidence that intensive blood pressure reduction is good! But, does this apply to everyone? Is there adverse risk to lowing BP this low? Also, what does this mean for our patients in the CKD clinic? Let’s take a look at the SPRINT study and try to answer these questions. SPRINT was a large randomized controlled trial with over 9,000 non-diabetic patients, funded by the NIH, to study the effect of intensive blood pressure control on cardiovascular health. The trial was terminated early (after a mean follow-up of 3.3 years) due to a significantly lower rate of the primary composite outcome (MI, ACS not resulting in MI, stroke, acute decompensated HF, or death from cardiovascular causes) in the intensive-treatment compared to the standard-treatment group. For more coverage of SPRINT go to NephJC. All patients were over the age of 50 (mean 68). 36% were female. Patients had elevated cardiac risk based on: a 10 year Framingham risk ≥ 15%, clinical or subclinical CVD, CKD with eGFR 20-60 ml/min/1.73 m2, or being over age 75. 28% of patients (~2,600) had CKD with minimal proteinuria (patients with > 1 g proteinuria or >; 600 mg of albuminuria were excluded). 28% of patients were over age 75 at enrollment, their mean age was 80. 43-45% of patients were on statins and ~50% were on aspirin. Over 60% of patients started the trial with a SBP of > 145 mmHg. Chlorthalidone was encouraged as the primary thiazide-type diuretic. The suggested initial triad of medications was a diuretic, CCB (preferably amlodipine), and ACEi or ARB. First, SPRINT was not designed to be a CKD progression trial. However, it did include a large group of patients with CKD. In the patients with baseline CKD, intensive blood pressure control had no effect on the composite renal outcome (reduction in eGFR of 50% or more, dialysis or transplantation), nor on the development of incident albuminuria. Indeed, in patients without baseline CKD intensive blood pressure control led to higher rates of developing an eGFR < 60 ml/min/1.73 m2 (patients had to have at least a 30% drop in eGFR). The significance of this is unclear. Importantly, in the pre-specified subgroup analysis, the cardiovascular benefits of intensive blood pressure management were similar in patients with and without CKD. The caveat to all of this discussion was that the trial was not powered to answer this question. What were the costs of aggressive treatment? While overall serious adverse events were not statistically more common (38% vs 37%), there were more episodes of hypotension, syncope, AKI, hyponatremia, and hypokalemia in the intensive group. Interestingly, orthostatic hypotension was actually higher in the standard treatment group and there was no increase in falls with intensive therapy. Patients were seen on a monthly basis by protocol if not at goal. Those in the intensive group had “Milepost Visits” every 6 months where the addition of medication was protocolized for patients with SBP < 120 mmHg (unless compelling contraindications existed). Notably, despite these aggressive measures half the patients were still unable to reach the intensive goal. What did we know about aggressive BP control prior to SPRINT? Nephrology dogma, codified in guidelines, has long argued for lower BP targets in patients with proteinuric CKD. A meta-analysis from 2011 combined the three key trials on aggressive blood pressure reduction (MDRD, AASK, and REIN-2) with a total of almost 2,300 primarily non-diabetic patients. The results suggested that aggressive blood pressure control (goals ranged approximately 125-130/75-80) on the whole does not improve CKD outcomes however sub-group analyses of proteinuric patients indicate the possibility of a benefit to stricter blood pressure control in terms of CKD progression. This possible benefit was seen in patients with greater than 0.22 g/g of proteinuria in AASK and greater than 1000 mg/d in MDRD. The recent JNC-8 guidelines argued however that this same data represented moderate quality evidence that lower BP targets do not slow CKD progression. For additional discussion of the post-hoc analyses of MDRD and AASK click here (previous review by Graham Abra on RFN). Given this potential equipoise perhaps it is unfortunate that patients with higher proteinuria were excluded from SPRINT. What do we know then going forward? Hypertension is a strong risk factor for CKD. While the exact goal remains unclear, controlling blood pressure to < 140/90 is likely to be beneficial. Importantly, as the nuances of SPRINT are discussed – including additional outcomes such as the effect of intensive control on cognitive function in the elderly – hypertension in general is still very undertreated. Based on a recent CDC report 65% of US adults over the age of 60 have hypertension but only ½ are controlled. While this represents improvement from around 30% at the turn of the Millennium this still means that ½ of the population is not meeting the more conservative goal of 140/90. Increasing the percentage of patients controlled to 140/90 should have a profound and meaningful effect on the incidence of ESRD. SPRINT shows us however that for some of our patients with CKD, aggressive SBP control to < 120 can provide tangible, though not dramatic, improvements in cardiovascular risk.